Pasta is a best snack or meal & ideal for any occasion. It is also children friendly & all kids love it. It is a great meal if done properly. My daughter loves the pasta especially the one with home made pesto. Normally pesto is made with pine nuts but can be done without it as well. Blanch broccoli in salted boiling water & cool it. 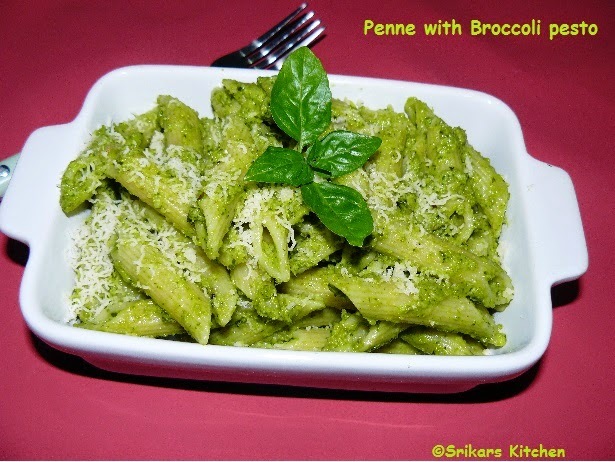 Pick basil leaves & add it with the cooked broccoli and blitz in a blender. Add in garlic, salt, olive oil & parmesan cheese to make a paste. Boil penne in salted boiling water. Would be better if you can use the same water used for blanching the broccoli for added flavour.Once the penne is cooked grain & drizzle with oil to avoid sticking. In a hot pan add in olive oil. Add in the chopped garlic & toss the penne with it. Add in the pesto paste and mix thoroughly to get a even coating on the pasta. Serve hot with cracked black pepper,grated parmesan & shredded basil. Fabulous recipe! Happy to follow you! Do visit my space too!